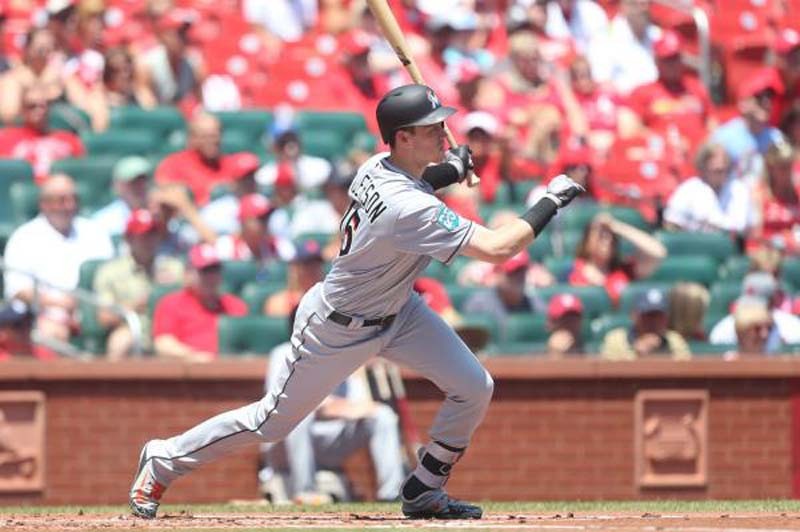 Star rookie Brian Anderson continued his hot season with a walk-off sacrifice fly, leading the Miami Marlins over the San Francisco Giants for the third consecutive night. Anderson's outfiled swat occurred in the bottom of the ninth inning, breaking the tie in the Marlins' 5-4 win Wednesday at Marlins Park. He is now hitting .308 on the season with four home runs and 33 RBIs. "The best thing you can do as a hitter is just try to realize that the pressure is not on you, it's on the pitcher," Anderson said. "I just tried to stay within myself and get something within the strikezone, something I could elevate. Anything in the outfield, because the last thing you want is a double play." "I just tried to stay relaxed and get something elevated"
Anderson stepped up to the plate with the bases loaded, facing Giants reliever Hunter Strickland. The righty fell behind in the count 3-1, before eyeing his third offering to the Marlins right fielder. Anderson hacked at the 91.4-mph fastball, sending it to ceneter fielder Gorkys Hernandez. The ball went just deep enough for Miguel Rojas to tag up from third base and slide in for the winning run. "He's obviously going to keep growing," Marlins manager Don Mattingly said. "He keeps getting in situations like that ... those are great moments for guys early in their career." Giants outfielder Andrew McCutchen plated the game's first runs with a two-run homer in the top of the first inning off of Marlins starter Caleb Smith. Cameron Maybin cut into the Marlins' deficit with an RBI single in the bottom of the fourth frame. Lewis Brinson stepped up to the plate as the third batter of the inning and smacked a ground ball single to shorstop Brandon Crawford. J.T. Realmuto came around to score, tying the game. Austin Jackson gave the Giants a 3-2 lead by plating Crawford on an RBI single in the top of the sixth inning. Justin Bour brought in a run for the Marlins with a line drive RBI single in the bottom of the same frame. Evan Longoria put the Giants on top once again in the bottom of the next inning. The Giants third baseman received plenty of gas from Marlins reliever Tayron Guerrero during that exchange. He eventauly knocked Guerrero's seventh offering - - a 100.6-mph fastball - - to center field for an RBI single. Bour ripped an RBI double to right field in the bottom of the eighth inning, tying the game at 4-4. Marlins reliever Drew Steckenrider pitched a scoreless ninth inning, giving the Marlins the opporunity to win in walk-off fashion. Rojas led off the bottom of the final inning with a single to left field for the Marlins. Yadiel Rivera walked in the next at-bat, pushing Rojas to second base. J.B. Shuck loaded the bases with a single, before Anderson stepped in for the game-winner. The Marlins host the Giants in the final game of the series at 12:10 p.m. Thursday in Miami. Miami has not earned a four-game sweep since a 2016 series against the Los Angeles Dodgers.